Hollywood might have been called Figwood if it wasn't for Mrs. Harvey Wilcox, whose husband, a Kansas real estate tycoon, began mapping out what today is known worldwide as the place where movies are made. Ostensibly, this famous section in Los Angeles was farmland but soon became the new destination for those wanting to escape the hard winters back east. The movie industry made Hollywood a city where the rich and famous live and where restaurants and studios and large homes became the norm. Only a little over 100 years old, this area has undergone dramatic changes which are evident in this gorgeous book. Many old buildings are used in movies and are thus recognizable to us (not as familiar as New York, however) and they still draw crowds of tourists and film wannabees. The book also includes a concise history of both Hollywood itself and the movie studios which I found interesting. Famous eateries, theatres, the Walk of Fame, churches, schools, etc. etc. If you're into nostalgia and the early movie industry, you're surely going to like this book. See my review on New Orleans Then And Now. 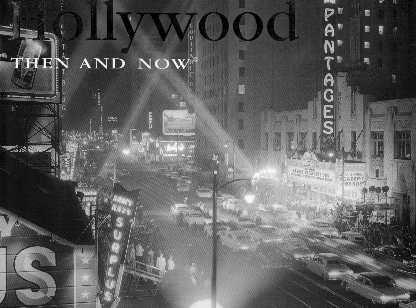 HOLLYWOOD Then And Now may be purchased and/or ordered through your local bookstore. Conclusion - Interesting and a great collector's book.